I have been substitute teaching a seventh grade reading block the last hour of every day. they could read for eight minutes. Some of them looked at me. There really wasn't all that much reading going on. (Right now, they have assigned seats. no one goes to the bathroom or gets drinks during our reading time). I dded five minutes to the timer every week. Yesterday they read for almost 35 minutes. Everyone's eyes were glued to their pages. Only one student asked me how much longer. And that was with seven minutes left. He does not willingly engage with a book. He looks for ways to get out of reading. Our school is part of a project where kids get to order a book every single month. He never voluntarily turns in his order. I always have to hunt him down. But yesterday, we had a break through. About halfway through, I could see that he was getting a little antsy. I had a couple of picture books that I was reading for CYBILS. One of them was a picture book called STORMY SEAS. I slid that onto his desk. Told him he could look at if he wanted. He flipped through the pages. Was silent for another 14 minutes. Usually we end our time together with a little sharing. So far, it's usually me talking about what I am reading. Or reading aloud a little. (I'm hoping that they will take it over soon, but it's all about baby steps). Over the Thanksgiving break I read REFUGEE by Alan Gratz. I brought the book to class yesterday. I told them how it's three seemingly unrelated stories. The first about a Jewish family fleeing Germany at the beginning of WW2. The second about a family fleeing Cuba on a life raft in the 1990's. I explained how at the beginning I wondered why the author had put the three stories in one book. About how I kept watching for connections. About how few there were and about how it sometimes even kind of irritated me, because I couldn't figure out how the stories were ever going to connect..
And then, at the end, the three stories wove together, the lives crossed. Paths connected. "That's just like what Ms. P said. The stories seem like they are not connected. And then at the end they do." He was talking about A LONG WALK TO WATER, which his language arts class just finished. I wanted to celebrate him. But not so much that his friends would make fun of him. Or that he wouldn't want to participate again. And so I acknowledged him. It was just like th book they had just finished. It was what his Language Arts teacher had said. But I tried not to make a big deal of it. Yesterday E became a member of the Literacy Club. And it was a huge deal to me. The sun seems to be setting on Poetry Friday. Lots of great offerings today! Thanks so much to everyone who participated on this holiday weekend! Michelle Kogan experimented with the Golden Shovel form this week. Besides her original poem and panting, she is giving thanks for poetry and music this week, with a glimpse into Katherine Paterson's Thanksgiving book GIVING THANKS, as well as Aaron Copeland's rendition of "Simple Gifts." 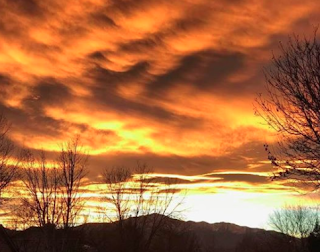 Carol Varsalona, who is celebrating Thanksgiving holiday with her gorgeous granddaughter today, has collected Thanksgiving poems and songs for us to enjoy. Molly Hogan's offering, "Thanksgiving for Two," is a must read for all of the empty nesters in the crowd. I probably shouldn't admit that it made me cry. Jone's original poem about how she'll spend Black Friday definitely matches my idea of a good time! And at her other blog, Jone's sharing some fall haiku written by her students. Over at The Poem Farm, Amy is enjoying the quiet celebrations of the day after a holiday. Her poem reminds me of "Introductions" by Susan Glassmeyer, that I saw on Parker J. Palmer's Facebook page earlier this week. Dori has been busy opening a new yoga studio (and writing a little poetry besides), but now she's back with ALL CREATION WAITS, a new picture book for Advent. Robin Hood Black has been really busy! She's not only found some poems, she's turned them into Christmas ornaments! Check them out! Anyone who has ever had to cut down a big tree (I did this almost two years ago and I'm still grieving) can sympathize with Buffy Silverman , who has written a tribute to her cherry tree that had to be cut down this week. Brenda Harsham revels in foliage in an original poem, "Goodbye Green." At Teacher Dance, Linda Baie celebrates the season with one last autumn poem, a Golden Shovel poem based on "Loss" by Carl Adamschick. Jane's celebration of autumn, an original haiku about the ginko tree, comes all the way from Japan. Little Willow laments that she didn't find Ted Kooser's "A Letter in October" last month, but I think it still fits the changing seasons pretty perfectly. Colette Bennett captures a moonlit moment in her original poem, "Pole Dancers." Over at A Year of Reading, the ever talented Mary Lee is gearing up to write haiku every day in December! She gives us a little appetizer today. Wow, wow, wow! Tabatha Yeatts' poem, Trees by W.S. Merwin is not an original, but it is definitely a celebration of all things autumn. I love the opening lines, "I am looking at trees/they may be one of the things/I will miss most from the earth…"
Matt Forrest Esenwine has great news. His new book, FLASHLIGHT NIGHT, was selected by the NY Public Library as one of the best books of 2017. It's also on Amazon's life of best selling books about books and reading! You will also want to stop over at Matt's blog to check out his Poetry Cubed contest! Kay McGriff took on Matt's challenge and wrote an original poem, "The Ghosts of Art," about some famous sculptures in her hometown. Her poem and the accompanying links made me want to visit Wilson, North Carolina! Holly Thompson made me laugh with her own new (or at least new-to-me) genre, the insinuation poem. And wonder how many insinuations I miss when I converse in Spanish! Over at Random Noodling, Diane gives all of us sugar addicts some harsh true to think about with her new original poem, "America=The Bottom Line." At Today's Little Ditty, Michelle is wrapping up the November Challenge, find beauty in something that is not usually seen as beautiful, and giving away a book. Be sure to make some time to read the poems, which are compiled here. Margaret Simon not only took on the challenge of finding something that is not usually seen as beautiful, but attempted a new poetry form, the Shadorma (a Spanish cousin to the haiku). The result is stunning. Violet Nesdoly also took on the "find something beautiful" challenge. She had previously written a shadorma about an apartment fire in her neighborhood. She's back with another poem about this building, this time it's a senryu. Sally Murphy has written an original poem in honor of the formerly "poetry poor" Linda Mitchell. I feel much better knowing that Linda is now "poetry rich," "poetry wealthy" and "poetry wise." Speaking of Linda Mitchell, she's in this week with a review of Katherine Erskine's new picture book biography, MAMA AFRICA, about Miriam Makeba, a Grammy award winning South African singer who "uses her voice to spread awareness of apartheid, and although in exile herself, bring hope to her people in South Africa." Ruth is in this week with her annual celebration of odes. I laughed when she said one of her eighth graders wanted to write an ode to bras! The Younger Sun Bookshop Kids' Book Club read TOO MANY FRIENDS by Kat Appel. They had lots of great questions about this novel in verse, so Kat answers them here. Our favorite foodie, Jama Rattigan, reviews DUMPLING DREAMS: HOW JOYCE CHEN BROUGHT THE DUMPLING FROM BEIJING TO CAMBRIDGE, a new picture book biography about Chinese cooking sensation, Joyce Chen. Jama is giving away one copy of this book. WARNING: Do not read this post unless you immediately want to run out and pick up Chinese food. Yummmm! Tara's Poetry Friday contribution, "The Cats" by Ann Iverson, seems to have some big life truths, even for those of us who are NOT cat lovers. It seems kind of funny to be hosting Poetry Friday, when I haven't even been participating recently. I'm hoping that hosting will get me back into the groove or participating each Friday. Originally, I thought I would probably do something holiday-related; either a Thanksgiving poem or maybe poetry books that shoppers could buy for holiday gifts. 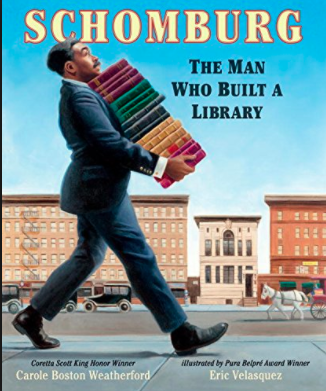 Then, in my CYBILS reading this week, I came across Carole Boston Weatherford's SCHOMBURG: THE MAN WHO BUILT A LIBRARY. I'm sharing this book today because I think it's really important, and I want a lot of people to see it. SCHOMBURG is poetry-- it's a story in verse-- about Arturo (Arthur) Schomburg, a Puerto Rican who immigrated to New York in 1891. According to the book jacket, "Schomburg's life passion was to collect books, letters, music, and art from Africa and from people of African descent." His collection became so large that he turned it over to the New York Public Library. Today it is known as the Schomburg Center for Research in Black Culture. This is an important book. I want my students (and my own sons) to read it, but I am not sure it's one they will fully appreciate on their own. I wonder, for instance, if they will notice the dates embedded into the pictures. I wonder if they will notice Schomburg's words in italics, "True scholarship requires time and calm effort; Tell our stories, proclaim our glories." I wonder if they will take time to read the end page, that says that each of Schomburg's books had a bookplate pasted into the front, and that's why this book also has a book plate in the front. That's why I'm looking forward to sharing it with them, a little at a time. UPDATE: Michelle H. Barnes actually interviewed Carole Boston Weatherford about SCHOMBURG in September. You can read that interview and more poems from the book at Today's Little Ditty. unheard-of authority for a black man at that time. unless it was complete from all angles. in building nations and shaping cultures. which would have been lost to a less inspired collector. through print, music, and art, Schomberg proved otherwise. did the twinkle leave Arturo's eyes? and look to the ground rather than the horizon? what my own racial group had contributed. He could not get his hands on enough books. Arturo had what he called the book hunting disease. and no library specialized in the subject. and leather books with paper mites between pages. because white collectors considered it junk. Still what he hunted was not easy to find. of artist, ornithologist, and naturalist John James Audubon. His masterpiece was the book Birds of America. he depicted North American birds in stunning lifelike poses. was said to be a Moor-- North African. still composed after he'd lost his hearing. could make him part with his prizes. a family member said, even in the bathroom. But Arturo's library had outgrown private hands. because the collection deserved a wider audienc. and staged exhibitions for community groups. to purchase his vast holdings. for $10,000 and in 1926 donated it to the library. Happy Poetry Friday! Leave your comments and I'll approve them and share them! 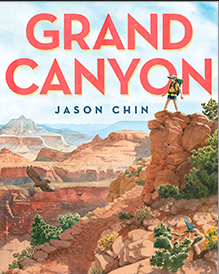 Last week, GRAND CANYON won NCTE's Orbis Pictus, for best nonfiction children's book of the year. This morning, I read GRAND CANYON, and I can definitely see why. I don't think I can do this beautiful, multi-layered picture book justice, I think it's one you will have to read for yourself but I'm going to try to describe it, just a little. GRAND CANYON follows a little girl and her father as they hike the South Trail from the bottom of the Grand Canyon to the rim. 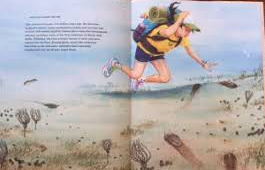 Most pages have "snapshots" of the discoveries the little girl makes as she hikes. Some pages devoted to specific animals- the California condor, the mountain goat, and dragonflies. There are also pages that show what the Grand Canyon looked like during times when it was covered by water, with the little girl swimming, surrounded by creatures. And many of the pages have a cut out that leads to a fossil on the next page. The gorgeous watercolor (I think) illustrations and the rich factual text would probably be enough. However, they are only the beginning. 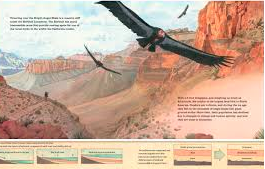 Each illustration is placed directly is placed directly on top of another illustration- usually some kind of a diagram associated with a particular layer of of the canyon, or of the wildlife that lives in that area. The book has lots of special features, including cut outs to the fossils, and one spread that opens out to a double wide. End matter includes pages of factual information about the geology, ecology, history, and human life in the Grand Canyon, as well as an author's note. The front end page is a map of the Grand Canyon, the back is a generalized cross section of the area. I could see giving it to someone planning a trip to the Grand Canyon. A person, child or adult, could spend hours and hours and hours with this book and notice something new every time they read it. Wow, wow, wow, wow, wow! Yesterday, when I shared THE SEARCH FOR OLINGUITO by Sandra Markle, I talked about how much I love reading books that take me in to the stories of people's work. 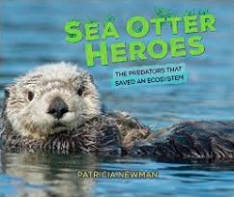 Last night, SEA OTTER HEROES: THE PREDATORS THAT SAVED AN ECOSYSTEM by Patricia Newman was at the top of my ginormous CYBILS nonfiction pile. It's a similar book. SEA OTTER HEROES follows the work of marine biologist, Brett Hughes. As a graduate student, Hughes studied the area called Elkhorn Slough in Northern California. Elkhorn Slough is located in the Salinas Valley, an area also known as America's Salad Bowl, because crops of strawberries, artichokes, brussels sprouts, lettuce, celery, tomatoes, spinach, and broccoli feed much of the United States. Farmers spray their crops with chemical fertilizers, then the run off drains into the waterways, which typically disrupts marine ecosystems. In areas such as Elkhorn Slough, one of the primary organisms affected is seagrass. The excessive nutrients from the fertilizers cause excessive algae growth on the seagrass, which means the seagrass can't get enough nutrients from photosynthesis. It dies, and then other living creatures in the food chain are also impacted. Brent Hughes was surprised to discover that this was not true in Elkhorn Slough. The population of seagrass was alive and healthy. Hughes was determined to find out why. One of his first hypothesis had to do with El Niño. Examination of data from the past twenty years proved that to be unfounded. He began seeking data from other sources and discovered a tour boat Captain, Yohn Gideon, who had collected research on animal sighting on each of his journeys for almost twenty years. In looking at his data, Hughes discovered a strong correlation between the sea grass and sea otter populations. Because Captain Gideon's research was not considered to be scientific enough, Hughes had to go still further. He talked to other scientists who had studied sea otters. He built mesocosms, a common lab technique, where a scientist actually builds an ecosystem in a bucket, barrel, or tank. And then he ventured into the slough, logging about one hundred hours over thirty days in a wet suit in the slough. Hughes hard work paid off. He discovered that sea otters eat sea crabs, who in turn eat sea hares, that eat sea algae that kills the sea grass. Without the sea otters, the sea crabs overeat the sea hares, which then allows the algae population to go out of control. I loved reading about this scientific mystery. I loved the full color photographs. I loved the pages of information about "Otterisms" and other related topics. I loved seeing the amount of perseverance it took for Hughes to solve his problem. I loved the end matter with suggestions of ways kids can help! Another terrific read! Maybe I'm a teeny bit nosy, but I love learning about how other people do their work. When I go to a play, I wonder what the actors do all day, and what they eat, and where they stay while their play is in Denver. I love (or used to love before they got so stinky) seeing pictures of the Broncos getting on their plane, or pictures of their post game food choices. 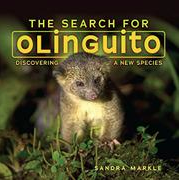 And I loved Sandra Markle's new book, THE SEARCH FOR OLINGUITO. In 2013, Markle read an article about the discovery of a new mammal, the olinguito, a raccoon-like species that lives in the cloud forests of Ecuador and Colombia. Markle tracked down Kristofer Helgen, a scientist at the Smithsonian, and Roland Kayes, head of the Biodiversity Research Lab at the North Carolina Museum of Natural Sciences, and pieced together the steps in their discovery. The journey started when Helgen was studying pelts of the olingo, a similar species, at the Smithsonian and noticed significant differences in color, fur texture, shape of ears, and tail length, on some of the species. He then examined pelts at other museums around the world and found those same features. After DNA research, he concluded that he had found a new species, which he named the olinguito. Helgen also learned about Ringerl, an olingo, who had been at zoos in Louisville and several other places in the late 1960's. Ringerl refused to mate or interact with the other olingos, and Helgen hypothesized that she had also been an olinguito. DNA tests confirmed his hypothesis. Helgen then needed to prove that olinguitos still exist. A Smithsonian intern from Ecuador scouted possible cloud forests, then Helgen and Roland Kayes, traveled to the Otonga Cloud Forest, close to Quito. They spent three weeks studying and photographing the olinguito. Even after that, their work was rejected by scholarly journals, because they didn't have enough information about the animal's physical features and habits. Helgen and Kayes had to spend an additional six years, from 2005-2011, studying the species before their work was accepted. Markle follows the scientists' journey with an an engaging story and full color photographs. It also shows readers how much patience and perseverance scientists have to have. A great book for a study of perseverance. And the book reads like fiction, so it would be terrific in a study of narrative nonfiction. Bugs! Ewww! I don't kill 'em, but I don't love them either! 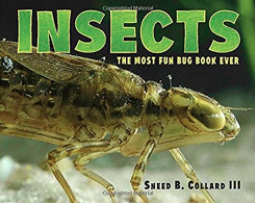 Even if you are not a big fan, Sneed Collard's INSECTS: THE MOST FUN BUG BOOK EVER, is more than a little interesting. Did you know, for instance, that there are more than 950,000 species of insects identified so far (that compare to 5,400 mammals or 10,600 birds or 33,200 amphibians? I also learned that insects have been around for 480 million years (again compare this to mammals, who have only been around for 180 million years). And that ironclad beetles have such strong shells that scientists have to drill holes to mount them. Dragon flies fly over 35 miles per hour. The dung beetle specializes in eating particular kinds of poop (according to page 26, if you try to feed cattle dung to a dung beetle that prefers elephant poop, he will unfriend you faster than you can say "Poop"). And that a diet of insects is healthier than what Americans eat now-- did you know that a hamburger is 18% protein, but a cooked grasshopper is 60%? INSECTS includes sections on body parts, chemical communication, reproduction, defenses and social groupings. Every chapter includes sidebars with related topics- things like how insects breathe, locust plagues, and colony collapse disorder, and diseases. The book is illustrated with beautiful full color close up photographs, taken by the author. There's not a lot of end matter, in fact Collard goes so far as to say that he's not going to suggest alternate sources because kids can find their own. He does, however, includes an extensive glossary. A book kids (and their adults) will definitely enjoy.